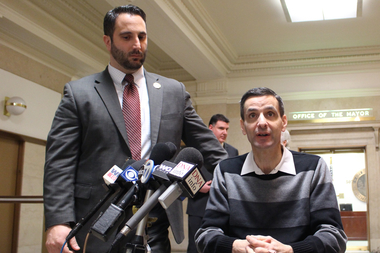 Aldermen Anthony Napolitano and Nicholas Sposato speak at a City Hall news conference earlier this year. JEFFERSON PARK — Several Chicago aldermen are organizing a "support your local police" rally under the tag line "Police Lives Matter" at the Jefferson Park District Headquarters on the Far Northwest Side on Thursday. "People in our community are saying they're tired of the abuse police are taking," said Ald. Nicholas Sposato (38th). "I sit down with these officers and talk with them every day, and they say, 'We feel like everybody's out to get us now,'" said Ald. Anthony Napolitano (41st). "If we're turning our backs on our officers because of the mistakes of a few," he added, "that's absolutely ludicrous, and I won't stand for that." Napolitano, who came to the defense of the Police Department in a speech that created a local online sensation last year, was unabashed about labeling it a "Police Lives Matter" rally. "Police lives matter. All lives matter," he said. "Why we titled it that was to make sure we get behind our police." Sposato, however, said it would be "mischaracterizing" the event to call it a response to the Black Lives Matter protest movement. He posted it on his Facebook page as a "police appreciation event." Asked if Black Lives Matter protesters might object to a catchphrase turning the tables on their group, Napolitano said, "I have no clue why they would. There's a Black Lives movement. There's a Police Lives movement. That's two totally separate things. "What if someone came up with Puppy Dogs' Lives Matter?" Napolitano added. "If you want to champion a cause, you should be allowed to champion it." "All lives matter probably would be the correct thing to say," Sposato said. Yet, on the possibility of objections from Black Lives Matter, he said, "I couldn't care less what they think about me supporting my local police." "I think political correctness needs to go to the wayside, and common sense needs to start coming back," Napolitano said. Aislinn Pulley of Black Lives Matter Chicago responded by citing several cases of Chicago Police misconduct. "Video recently surfaced of a young man named Shaquille O'Neal being beaten into unconsciousness by Chicago Police," Pulley said. "Dante Servin got away with murdering unarmed Rekia Boyd and avoided firing by resigning two days before the start of his termination hearing was set to begin. Jason Van Dyke, the cop who killed Laquan McDonald by shooting him 16 times, has been hired by the [Fraternal Order of Police]. "There is little dispute within the dominant culture that 'police lives matter,'" he added. "In fact the problem is they matter so much that they are protected at all costs from consequences of criminal activity even when they murder. The real question is why don't our lives matter? Why do police keep getting away, literally, with murder?" Police Department spokesman Anthony Guglielmi, however, defended all sides of the issue, saying, "Regardless of the theme, our job is to protect the First Amendment and all individuals' rights to assemble and demonstrate on whatever topic they choose." "It's a public support-your-local-police rally," Sposato said Tuesday at City Hall. It's set for 6 p.m. Thursday at the Jefferson Park District, 5151 N. Milwaukee Ave.
Sposato, a former firefighter, said it grew out of private meetings of support he'd had with Napolitano, a former cop and firefighter, and officers at the district. The public is invited, he added, although the rally is being conducted without the formal cooperation of Jeff Park Cmdr. William Looney. "I told him we were coming out," Sposato said. "He can't stop us." "I think he's happy," Napolitano said. "I think he knows that's an area out there, the Northwest Side, that's really behind our police officers." With Chicago's employee residency requirements, pockets of the Northwest Side have developed reputations over the decades as havens for cops and firefighters and their families. Sposato said it was probably the area of the city where police support is strongest, rivaled only by the Southwest Side. Yet in the current environment of police protests in the wake of the Laquan McDonald case, other districts have rejected similar pro-police rallies. Morgan Park District Cmdr. Mark Harmon politely declined such a proposed rally in March, saying, "While we always appreciate the support, we would prefer not to have a rally." Napolitano said the rally was necessary because of the "incredible influx in crime throughout the City of Chicago" this year, with murders on pace to possibly reach 600. With police on the defensive, he added, "If we're not supporting them, we're gonna have a tough summer." Napolitano said he expected a good turnout, perhaps a couple hundred people. "I hope we get a lot of people. I assume we will," he said. "We cherish our police officers."